Hinckley Cemetery is situated on Ashby Road, Hinckley, Leicestershire LE10 1SL. 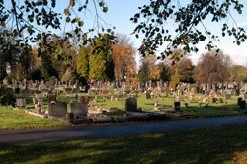 This cemetery is owned and managed by Hinckley & Bosworth Borough Council through our Cemetery Services Team. The cemetery office is open for funeral bookings and enquiries Monday to Thursday 8:30am to 5pm and Fridays 8:30am to 4:30pm (excluding public bank holidays). Should you wish to view the Book of Remembrance outside the opening hours, please contact the cemetery office on 01455 255707 to arrange an appointment (48 hours notice is required). The cemetery office is open for bookings and enquiries Monday to Thursday 8:30am to 5pm and Fridays 8:30am to 4:30pm (excluding public bank holidays). Cars are allowed into the cemetery when the main gates are open. Please adhere to the speed limits and please do not block access for other cemetery users when parking on site. When a funeral cortege enters the cemetery it is under the control of the sexton or other authorised persons in attendance at that time. No vehicles (unless part of the funeral cortege) will be allowed in the cemetery when a funeral is in progress. During June and July 2016 we carried out a public consultation to establish people’s views on the management of Ashby Road Cemetery. The results of this consultation will be used to help write a new management plan which will include a five year action plan of improvements. The consultation questionnaire was split into two sections, section A - existing cemetery facilities and amenities, and section B - new facilities. The headline findings from section A were that people found the overall provision and maintenance of landscaping such as flower beds, lawns, hedges and trees to be good, along with the provision and maintenance of signage, footpaths and roads and the cemetery boundaries. Areas for improvement included provision of parking areas, disabled access, and the provision and maintenance of buildings and other facilities such as the cemetery toilets, seating and bins, which were all considered average by the majority of people. The majority of respondents were supportive of our plans for the changes and new facilities listed in section B of the questionnaire, including keeping dogs on leads, changes to cemetery opening times and a number of memorial structures to be located in different parts of the cemetery. A copy of the full results can be obtained by contacting the Cemetery Office on 01455 255707 or using our contact form. There is no crematorium in this borough. One of the nearest crematoriums is the Heart Of England Crematorium, Heart of England Way, Nuneaton, Warwickshire CV11 6WZ. Telephone: 02476 350646. To provide a respectful, efficient and sympathetic burial service to the community and our key partners, for example: funeral directors and monumental masons. A leaflet of the Ashby Cemetery information is now available for download.